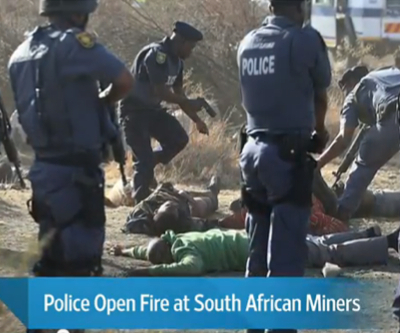 Miners have gone on strike at South African producer Lonmin (LON: LMI) after a man believed to be a National Union of Mineworkers' (NUM) member was shot dead and another person was injured on Monday. The incident sent the company's shares diving almost 5% and has sparked fears of a repeat of last year’s violent unrest that left dozens dead and effectively shut down the country's platinum belt. In a statement, Lonmin said work had stopped at all of the firm's 13 mining shafts due to "an illegal work stoppage." "Employees have arrived at work but have not proceeded underground. The reasons for the stoppage are still not clear," it added. Reuters reports Monday’s shooting happened at the NUM offices at Wonderkop community, near the town of Marikana, which is 120 km northwest of Johannesburg. The area is where police shot dead 34 miners in August 2012, considered the country's deadliest police action since the end of apartheid. The incident follows the killing of a leader from NUM's rival union, the Association of Mineworkers and Construction Union (AMCU), last month.